Welcome to Hell has quite a full story. After preparing to do battle with the devil himself following your consecration of the UAC base in the Andes Mountains, you wake up in a bizarre hospital / base next to a marine who has committed suicide, but not before leaving a voice recording narrating his struggles in the compound you now occupy. Hell is no picnic and the trials of the captives are never ending, running the same infernal gauntlet over and over again. You grab his sidearm and prepare to sally forth to give the devil his due. Schmitz’s HNT files, besides giving handy information relevant to each level (including how to escape from the cell you begin in), narrate your further experiences in MAP06 and 07, though 07’s dictation interestingly assumes a losing scenario. As for the levels themselves, Schmitz has improved upon the crystal sector effect he put to good use in Artifact’s MAP03 and has included even more puzzle-style gameplay. Each level plays much different from the next, though. The Hospital is a more traditional Hellish base excepting the forcefields and a few uses of the transparent floor. The Asylum is where things really take off. Its sparser monster count doesn’t do much to alleviate the difficulty of a pistol start, and it’s a portmanteau of visual delights, in part due to the crystal sector and also due to a masterful manipulation of light and shadow. I’d say this mapset is worth playing just to experience MAP06 alone, though it’s a bit more confusing puzzle-wise, and the crazy visuals don’t help matters much. Journey’s End is a fitting coda. It’s not nearly as obnoxious a fight as Artifact’s climax. That is, unless you fail Schmitz’s time limit. Once you get access to the central platform, however, it’s fairly easy to just camp out until the pillar opens and you bash the boss brain in. All in all, it’s a great experience. WELHELL isn’t as impressively vast an experience as Artifact, but it’s a great trilogy that further pushes Schmitz’s mapping talents and showcases some novel aesthetics. I highly recommend it, at least to anyone looking for something a little beyond traditional Doom II fare. If you dislike puzzles, though, avoid this. Nice opening number, a strange fusion of marble, techbase and wood. It's primarily a puzzle map, really, as you need to locate all three keys and use them not only to open doors but to lower their associated bars. Exiting your personal cell will prove maddening if you didn't read the associated .HNT file (open it in Notepad or something). Some neat sights to see here, like the two grand staircases choked with chaingunners and cacodemons, and lighting looks great throughout the entire map. 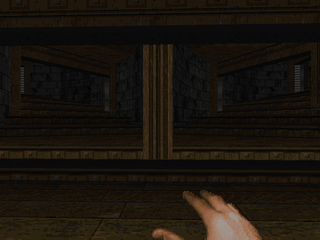 My standout encounter is probably the aforementioned cacodemon / commando wave, though the surprise you'll have to confront at the map's end is another goodie given the environment. As typical of Schmitz's maps, there's a boatload of health and ammo stashed for those willing to find it, and they're not even the secrets! Whoa. This map is bizarre, using pitch-black lighting contrasted by bright light as well as Schmitz’s favorite special effect, the crystal sector, creating a trippy and dangerous journey. The monster count is low but pistol starters should have a devil of a time with moments like the map’s opening gauntlet as well as several encounters you’ll be ill-equipped to handle, at least at first. There are a large number of secrets to sort through, however, which provide you with handy weapon and ammo caches, the better to smite Hellspawn with. 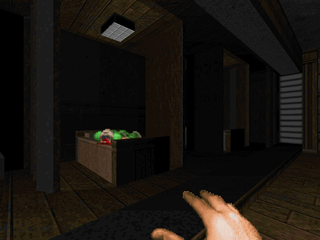 There’s no section of this level that doesn’t work as eye candy, from the jail cells at the opening to the floating staircases interspersed throughout. Apart from the opening fight, none of the encounters really stand out, except for the finale where a number of beasties are let out into the invisible, winding staircase in the map’s western area. 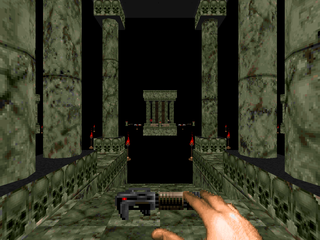 A boss map in the same vein as MAP06 (think buildings suspended in total darkness) with four marble temple structures in the cardinal directions as well as a central structure where the boss pillar resides. It’s a neat little encounter that starts out by leaking in a few cacodemons while you have to wipe out some arachnotrons and mancubuses in opposing structures to get access to a handy switch. 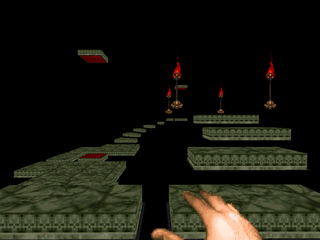 Schmitz also drops a Cyberdemon in on you at some point, which makes things a little more interesting, though it’s easy to abuse the crystal sectors to be on the safe side. Eventually you’ll introduce a few more playmates, including one specifically for the Cyber, and you get the boss shooter proper. As Schmitz notes in the HNT file, this map is on a time limit. If you don’t blow up Romero’s head within the window afforded to you (which arrives after five minutes), you’ll never make it out. Wow, thanks VDGG! Spoilers for MAP07 because I didn't even realize this - The map uses the Dead Simple feature in conjunction with the boss shooter. 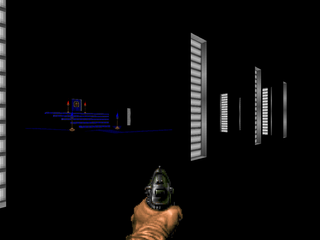 You need to activate the tag in order to confront the shooter. 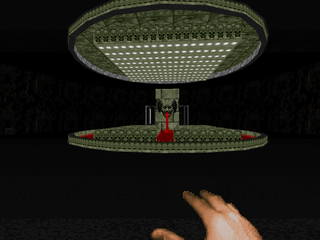 If you kill any arachnotrons beyond what's initially present in the map (i.e., the spawner makes more), it will make the switch that activates the exit elevator (which also grants access to a number of arms and powerups) inaccessible. While you may technically be able to dispatch Romero's head from a distance, I wouldn't count on it given the limited frame of time during which you can act.